October 14, 2011 - In 1786, a group of visionaries gathered at a Boston tavern with the shared goal of reducing the loss of life at sea. America's first maritime lifesaving service was born of their initiative, called the Humane Society of the Commonwealth of Massachusetts. The practices of this agency were used in the creation of the federalized U.S. Life Saving Service, which merged with the Revenue Cutter Service to become the Coast Guard in 1915. One of the first successful Coast Guard air stations was also established in Mass., utilizing a Vought UO-1 seaplane (borrowed from the Navy) at Ten Pound Island in 1925. The Coast Guard had successfully tested aircraft for search-and-rescue (SAR) purposes as far back as 1915, but hadn't yet been able to get the funding to put them to use. 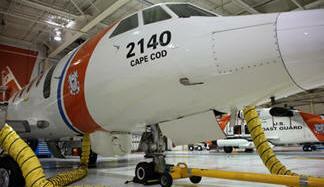 These days, Coast Guard aviators in the region fly out of Air Station Cape Cod. I had the privilege of deploying to this hot spot of lifesaving practice and tradition on Aug. 27, 2011 to document the arrival of Hurricane Irene. When word came that the storm would hit Mass. on the 28th, the Coast Guard was ready with the wisdom of centuries, satellite imagery and established agency partnerships. Weathering storms in the Northeastern United States is in our services ancestral DNA. As Irene struck the coast a single watch stander at Air Station Cape Cod. Lt. Adam Burda, intently monitored phones and the VHF marine band radio, a paradigm of the service's ageless devotion to the call for help. Reports began to come in. Flash floods had driven people onto rooftops in Connecticut. Power outages were widespread throughout the Northeast. Risk assessment is an outlined process that basically weighs the peril of the person that needs saving versus the peril of the crew going to save them. It helps determine what the best vehicle, action or agency may be. National Guard troops, or local responders could have more applicable capability to perform a rescue. It isn't about being a hero as much as making sure everyone gets to go home at the end of the day. "One of my biggest concerns is putting my crew in harm's way, so we really urge folks to heed the warnings of their local authorities," said Lt. Cmdr. 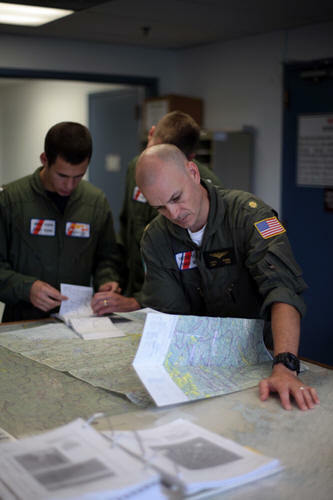 Curtis Brown, an aircraft commander and pilot at the air station. Brown spent a large part of the hurricane laying out charts and determining if our guys should launch. As the risk became acceptable, assets began to hit the tarmac and crews began to suit up. The first aircraft to depart was a Coast Guard HU-25C Falcon with a five-man crew, and your writer as a passenger. A brief call for help had been reported with no further attempts to communicate, referred to as an uncorrelated mayday. No assumptions can be made when the Coast Guard receives an uncorrelated mayday. As likely as it is to be nothing, is the likelihood that a person was only able to get out one call for help prior to their boat sinking or loss of power and communications. Lt. Ashley Lovejoy was one of two pilots assigned to the first flight. "I recently transferred from Air Station Miami about a month prior. The night we flew was my second duty night in Cape Cod," said Lovejoy. "Besides pop up thunderstorms and large systems, flying in Miami is very mild compared to Cape Cod." Lovejoy described the overall feeling as excitement mixed with a little trepidation, "I've flown in similar conditions only once before during Hurricane Ike, but never anything as extreme as that night. Despite the weather and my little time at the unit I was confident in both the crew and aircraft's ability." The Falcon crew screamed down the runway and hit the sky with wings dipping dramatically as it was blasted by Irene's fury. The crew's manner was calm and confident. Not a visible hint of fear. As the aircraft took flight the wind gusted at 62 knots, or just slightly over 70 miles per hour. The plane pushed into a thick ceiling of clouds with rain tracing the window frames, and after a very long moment, the cockpit emerged into daylight. The crew protected their eyes as the sunlight streaked through the reliable HU-25C's airframe. "Breaking through the clouds definitely made me feel better, but I also knew we had to fly back into it to get to the search area," said Lovejoy. Weather had improved by the time we reached the sea and conditions were acceptable for flying low search patterns. Petty Officer 2nd Class Jason Stanberry, an aviation electrical technician at Cape Cod, called out for vessels in distress on marine band VHF frequency. Co-pilot Lt. Phillip Wade and 3rd class aviation maintenance technician petty officers Ryan King and Jason Zeddies searched the sea for any signs of vessels in distress, but after extensive efforts the search was suspended. Accompanying the strange feeling of suspending the search, was an odd realization. "The area that we were flying is perhaps some of the busiest airspace in the country maybe even the world, but we were literally the only plane in the sky," said Lovejoy. "Air Traffic Control, New York Approach, Boston Approach, New York Center, we were literally their only customer. We didn't know for sure which airports were open or providing fuel service. They kept us informed of changing weather conditions, airport closures and any other info we asked about." As the Falcon crew prepared for the return trip radio traffic began to ramp up. Through the increasing activity, another rescue call was heard. A vessel in distress was calling for help, and this one was unmistakable. The crew was quickly able to locate the 2nd vessel, which had been grounded on rocks and was taking on water. They identified a small life raft departing the vessel and making its way safely towards shore. The coordinates and information were relayed back to Coast Guard operations centers and, after doing a few circles, the Falcon departed the scene to refuel. Landing and taking off during the gusting winds was another memorable evolution. A third search was conducted for an inflatable boat reportedly drifting in Norwalk River, but nothing was found. After the search we landed at Boston Logan Airport to wait for winds to subside. The international airport was practically empty of aircraft and personnel, another eerie moment. The crew finally ended up spending the night in Boston to wait out the storm, and I departed by rental car back towards Cape Cod. A report came in at approximately 3:30 a.m., Aug. 29th, that waves had swept a man and woman from rocks at Narragansett Beach, R.I. Reports stated that the man had made it back to shore, but the woman was still at sea. An MH60T Jayhawk helicopter crew was sent to assist. In the world of SAR, strange stories are relatively common. Reports that would be hard to make up are abundant. We sometimes call them sea stories, as the tales get taller and taller. The below, hard to believe account, is a true sea story. The Jayhawk crew located the person in the water and lowered a rescue swimmer. When he reached her, the swimmer was notified by the young lady in the cold, pre-dawn, post hurricane, Atlantic Ocean, that she was in no need of assistance. The determination was made to conduct the rescue, and she was resistantly taken aboard the aircraft to be transported to a nearby hospital. A strange judgment call made under extreme duress by a young rescue swimmer. The rescued person turned out to be intoxicated and her impaired decision to remain at sea could have cost her life. Capt. David Throop, Commander of Air Station Cape Cod expressed that following the storm one of the biggest things would be assessment of the ports. Other agencies would be depending on our 'eyes in the sky' to determine what areas would need aid and how to prioritize those needs. "This activity would be essential to things returning to normal," said Throop. At about 5 a.m. the sun began to rise. The first Jayhawk helicopter had returned from its rescue mission, and a second was on the tarmac getting ready to fly. Stars in the west submitted to the rising sun in the east with a cloudless sky between. Birds and insects remained strangely silent. I remember thinking how strongly the environment contrasted the roaring winds of the day before. The assessment helicopter picked up Congressman Tim Bishop, Senator Kirsten Gillibrand and Capt. Joseph M. Vojvodich, Commander of Sector Long Island Sound. The crew, passengers and I flew along the Sector Long Island Sound area of operations where neighborhoods had become inaccessible, flooded and lost power. "Overall, my impression of the south shore of Long Island and its bays was that we weathered the storm pretty well," said Vojvodich, whose area of responsibility includes all of the coast and navigable waterways of Connecticut, Long Island Sound itself and the coasts and back bays of Long Island. "I noticed some surge waters in some communities in the northern portions of the Great South Bay and Moriches Bay, but you could already tell that the water was receding, said Vojvodich. "I was concerned about any breaches along the south shore of Long Island and excessive shoaling of the inlets, but we weathered the storm pretty well." He went on to say that, "In the end, our ability to invoke a confidence in our waterways for recreational boaters, commercial operators, and the maritime industry, especially when a crisis occurs, is the true value of the public service that the Coast Guard brings to the table." Air Station Cape Cod was commissioned on Aug. 29th, 1970, celebrating its 41st birthday the afternoon following the storm. 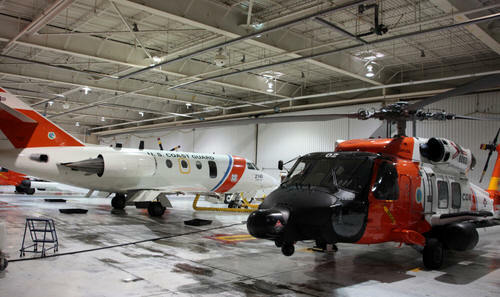 It is the Atlantic Coast's only Coast Guard aviation facility north of Atlantic City, New Jersey, and its area of responsibility spans Northern New Jersey to the Canadian Border. In Mass., early notifications had not been ignored. When the storm arrived, airports were like ghost towns and many neighborhoods had been evacuated. 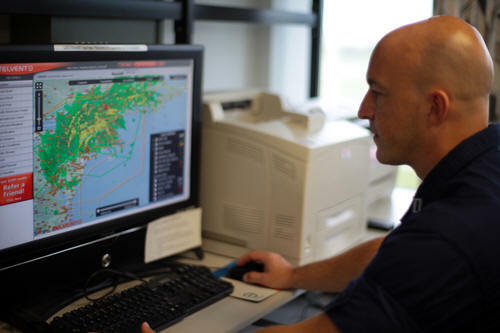 In the region that gave us SAR, Hurricane Irene was a case study of preparedness. Another storm for the books, to test our skills, crisis communications and the effectiveness of our programs. 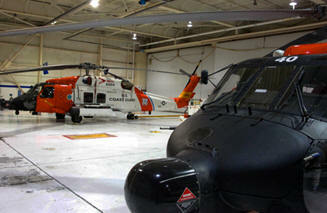 To the Coast Guardsmen on watch it was a day representative of the reasons we join the service. As a new response crew replaces those that stood the hurricane watch, the same ritual is being conducted at stations up and down the coast. Tales of the previous day are passed to the new ready crew, and those lessons become part of the Coast Guard's ongoing story. The HU-25 Guardian (Falcon) is a medium-range surveillance fixed-wing aircraft. It is a military derivative of the Dassault Falcon 20 business jet, of which more than 500 were built for worldwide use. The HU-25 performs search and rescue, law enforcement such as migrant and drug interdiction, marine environmental protection and military readiness. The first of 41 HU-25s was delivered in February 1982 and deliveries were complete by December 1983. The HU-25A and HU-25D are 56 feet three inches in length (the HU-25C is 57ft 6 inches), with a wingspan of 53 feet six inches and height of 17 feet seven inches. The service ceiling is 42,000 feet, though current avionics restrict operations to 28,000 feet and below. Maximum cruise speed at altitude is 420 knots (about 470 miles per hour), with a maximum operating speed of .855 Mach. Sea-level maximum airspeed is 350 knots (about 400 miles per hour). Key features of the Falcon include its dash speed and capable mission sensors. The three models of the HU-25 (-A, -C, and ?D) are distinguished by their sensor complement. The HU-25A has an APS-127 surface search radar. The HU-25C has an APG-66 air-to-air/surface search radar, electro-optical/infrared (EO/IR) sensor, and tactical workstation. The HU-25D has an APS-143B multi-mode radar, EO/IR and tactical workstation. A sensor upgrade program in 2002-03 improved capabilities in HU-25Cs and reconfigured 6 HU-25As into HU-25Ds. An avionics upgrade in 2005-06 upgraded the navigation system with modern equipment common to the HH-65B. The MH-60T Jayhawk helicopter is a medium range response asset designed for offshore operations, capable of providing shore-based aviation surveillance and transport. It is the workhorse helicopter of the Coast Guard and its predecessor, the HH-60J, was originally fielded over 17 years ago. The upgraded model is a very capable aircraft for any law enforcement, surveillance or search and rescue mission. The common avionics architecture system (CAAS) in the cockpit, provides fully integrated flight and mission management capabilities. Using five multi-function display screens, aircrews can display radar and forward-looking infrared data, monitor the traffic collision avoidance system and view imagery fed into the cockpit from the rescue hoist camera. The Airborne Use of Force (AUF) equips the aircraft with a 7.62 mm machine gun for firing warning shots and a .50-caliber long-range rifle for precise targeting, such as disabling the outboard engines on a non-compliant go-fast boat. A fully integrated electro-optical/ infrared sensor system (ESS) with Trakkabeam searchlight is permanently mounted outside the pilot?s door. ESS provides aircrews with enhanced capabilities to locate, identify and track surface targets day or night, which is a critical capability for both search and rescue and law enforcement missions. Other capabilities include the Helicopter Integrated Data Storage (HIDS), which stores information from the ESS system, and the Helicopter Airborne Video System (HAVS), which records audio and video from the ESS and the hoist mounted camera that covers the hoisting area. The history of Air Station Cape Cod: - (From the Coast Guard Historian Office) -Coast Guard Air Station Cape Cod was established on Aug. 29, 1970 when the Coast Guard Air Station at Salem, Mass., and the Coast Guard Air Detachment at Quonset Point, R.I. were consolidated, providing a much greater degree of efficiency in the maintenance and operations of the Sikorsky HH-52A Sea Guard and the Grumman HU-16E Albatross. These two versatile amphibians served at the air station until they were replaced by longer-ranged aircraft in the early 1980?s. In Dec. of 1976, the Liberian freighter Argo Merchant broke up after running aground on Nantucket Shoals. The disaster brought marine environment protection to the attention of the nation. The cargo carrier Eldia went aground on one of the Cape?s outer beaches in early spring of 1984. An Air Station Cape Cod HH-3F helicopter crew safely evacuated the fifteen-man crew of the Eldia in winds in excess of 40 knots when the ship was in danger of breaking up. Probably the air station?s most famous rescue occurred in 1987. In March of that year, the Soviet Motor Vessel Komsomolets Kirgizzii sank 200 nautical miles south of the Massachusetts coast. Three of Air Station Cape Cod?s helicopters rescued the 37-man crew from the Russian ship in 20 foot seas an winds gusting to 50 knots with no major injuries. For their extraordinary efforts, the air crews were invited to the White House by President Ronald Reagan to be honored in a Rose Garden ceremony. On Dec. 28, 1988. The 256-foot container vessel Lloyd Bermuda capsized in 35-foot seas throwing its crew into the icy waters. An HU-25A Falcon jet and two HH-3F helicopters set out in 50 knot winds and poor visibility to locate the survivors. Working with limited fuel in the worst of conditions, the crews successfully rescued six men, four of which survived. When it was all over with, the crew of one helicopter had logged 9.7 hours in the demanding flight conditions. Cape Cod is the Atlantic Coast's only Coast Guard aviation facility north of Atlantic City, New Jersey, and its area of responsibility spans Northern New Jersey to the Canadian Border.